Hello, everybody -- we're so glad to see you! Music Together® is an early childhood music and movement program for children birth-8 years and the grownups who love them. First offered in 1987, our curriculum has decades of research behind it, in both music education and child development. Since children learn through play, our classes help little ones develop their innate musicality through engaging, fun and diverse music experiences. We recognize that young children learn best from the powerful role models in their lives. Our family music classes show parents and caregivers how to help their children become confident music-makers, just by having fun making music themselves. Bringing families together in a warm, supportive environment -- and creating lasting family and community bonds through music -- is a huge part of Music Together. Our classes can be found at more than 3,000 locations in over 40 countries. Across the globe, families sing and dance to the same music in the same fun, informal class setting that is the hallmark of our program. We’re on a mission to make the world a better place by making it more musical – we hope you’ll join us! PAMELA TROKANSKI DANCE WORKSHOP: Your registration will be processed on a first-come, first-served basis according to the schedule below. Simply select Register for a Class from the pull-down menu under "Our Classes". DAVIS ARTS CENTER: Registration is completed directly through DAC. You may register online at http://www.davisartscenter.org; in-person at 1919 F Street; or by calling (530) 756-4100. SPRING 2019 CLASSES BEGIN 4/1! Register now for our 10-week spring session, featuring the Tambourine song collection in our mixed-age & babies classes, and the all new Toucan song collection for Rhythm Kids! 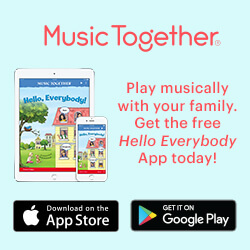 We invite you and your child(ren) to attend a free sample class, to see if Music Together is a good fit for your family. GET THE APP & HEAR OUR MUSIC! Copyright 2018 Music Together of Davis. All rights reserved.